Ranganna oíche Ghaelchultúir - dreas aclaíochta don inchinn! Aip nua Ghaelchultúir (‘Amhrán na bhFiann’): leigheas ar an mungailt! Mura bhfuil liricí amhrán náisiúnta na hÉireann ar eolas agat, beidh aip nua Ghaelchultúir, Amhrán na bhFiann, ina chuidiú mór agat! Agus an aip dhátheangach seo íoslódáilte agat, is féidir leat éisteacht le duine ag rá na bhfocal go mall ar dtús agus iad a léamh ag an am céanna. Ansin, is féidir leat éisteacht le hamhránaí ag rá an amhráin agus, ar deireadh, triail a bhaint as an leagan karaoke tú féin. Tá aistriúchán Béarla de na liricí Gaeilge mar chuid den aip freisin. Ní hamháin gur féidir liricí “Amhrán na bhFiann” a fhoghlaim leis an aip, ach tá tráth na gceist curtha ar fáil chun gur féidir leis an úsáideoir a chuid eolais maidir leis an amhrán a thástáil. 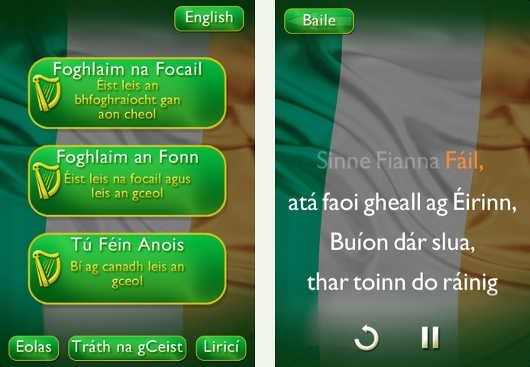 Níl ach 89c ar an aip agus is féidir é a íoslódáil anseo nó trí “Irish National Anthem” a chuardach san App Store. Mar sin, déan Amhrán na bhFiann a íoslódáil anois agus an chéad uair eile a bheidh tú ag imeacht spóirt beidh tú in ann é a chanadh os ard gan aon dua!